Drambuie is made from a unique blend of finest Scottish whiskies, many of which are 15- to 17-year-old single malts, together with a hint of heather honey and finally a secret combination of herbs and spices. A versatile drink that can be served neat, on the rocks or in the classic rusty nail cocktail. 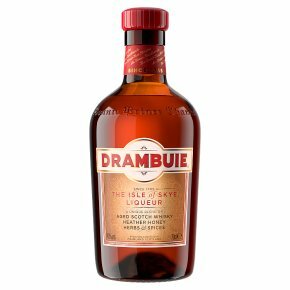 Drambuie is a remarkable blend of aged Scotch malt whisky, heather honey, spices & herbs. Reveals complex floral, herbal, spicy, sweet and rich honey overtones. Imbued with a spirit of warm hospitality, it's versatile for the cocktail drinker and home cook alike. Makes a great pairing with savoury foods and desserts; in cocktails or simply on its own. Drambuie is your go-to staple. A unique blend of aged scotch whisky heather honey herbs & spices After 100 years as a local secret, production started on mainland Scotland, and as Drambuie's fame spread it was soon being poured in the finest bars around the world. Today, the legend lives on, embodied in classic cocktails like the Rusty Nail? and the Drambuie Collins. Drambuie is an extraordinary blend of aged Scotch whisky, heather honey, spices and herbs. It is a unique spirit that offers drinkers an extraordinary taste experience. Drambuie is a bright, deep golden colour, with the aromas of aged malt whisky combined with a mix of floral and herbal overtones and rich honey. The flavour provides a kaleidoscopic taste sensation, a complex arrangement of herbal, spicy, sweet and honey notes. It's voluptuous, mellifluous and full bodied. Why not try the Drambuie Collins? A refreshing mix of Drambuie, Soda Water, Lemon and Mint. 25ml Drambuie, Half a Lemon, 8 mint leaves and top with Soda.